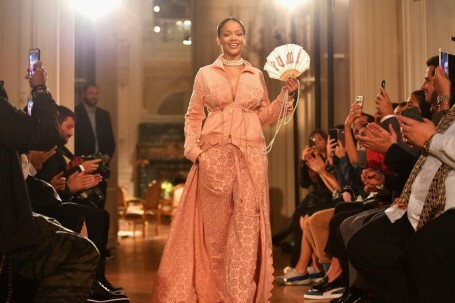 In the spirit of Paris Fashion Week, this season’s FENTY collection interprets the romance and grandeur of French culture with a delicate color palette, luxurious fabrics, intricate ruffles and pleating, and playful bows and ties. Rihanna stayed true to PUMA’s sport heritage by reimagining and transforming traditional track suits, boxing robes, tennis dresses and polos. The collection continues to play with exaggerated and oversized shapes, while soft pinks, lavenders, and nudes compliment and contrast hard, edgy, sporty looks in olive and rich brown. The collection, designed for both men and women in mind, includes tiered jackets, in a lightweight onion skin fabric, embroidered tricot track dresses and suits, and jacquard pieces uniquely featuring the signature PUMA cat in a custom FENTY floral motif. Accessories bring out the feminine yet masculine juxtaposition of the 18th century with the Lace Mesh PUMA Cat Choker, the Bow Bag and the Lace Roll down bag (with a unique neck choker). The everyday baseball cap is no more as the FENTY PUMA by Rihanna hats feature engineered mesh, sneaker lace accents, PUMA cat lace masks, satin bandanas and oversized visors. The collection wouldn’t be complete without shoes. Rihanna updates the iconic FENTY Sneaker Heel from Autumn Winter ‘16 with three new styles including a Slingback Sneaker Heel that artistically and practically uses PUMA’s signature formstripe as the strap. New shoes such as the Bow Sneaker express a fusion of sport and fashion. The Slide returns in two new executions: in Jelly and with a bow. Finally, Rihanna brings aggressive, new sneaker boots to round out the footwear range.